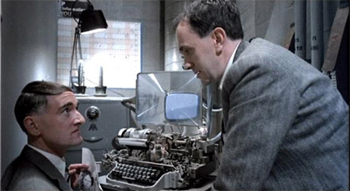 Prior to production of BRAZIL, Terry Gilliam, co-screenwriter Charles McKeown and actor Jonathan Pryce recorded a read-through of a draft of the script, with Pryce taking the role of Sam Lowry, and McKeown and Gilliam dividing up the rest. There is some overlap in roles  both McKeown and Gilliam read the part of Jack Lint, Lowry's old friend and fellow employee at the Ministry of Information. The existing recording was not a complete read-through  scenes without Jonathan Pryce, such as Jill Leighton's appearance at the Ministry of Information to complain about the Buttle arrest, were not included. What is most interesting is listening to McKeown  while his performance as Harvey Lime closely mirrors what he brought to the role in the film, his interpretation of heating engineer Harry Tuttle is startlingly different from Robert De Niro's, bringing to mind Peter Sellers in such films as THE LADYKILLERS and I'M ALL RIGHT, JACK. Lowry (Pryce) and Mr. Kurtzmann (McKeown) discuss a refund check for electrical charges (the costs of Buttle's torture) made out to the victim; Lowry then pays a visit to deliver it to his widow. At the cosmetic surgery salon of Dr. Jaffee (Gilliam), Ida Lowry (McKeown) berates her unambitious son  note comments about the accent. Lowry seeks information from Lime (McKeown) about his "dream girl." A dream sequence (never filmed) at the Storeroom of Knowledge, where Lowry receives his armor from a JOLLY GENT (McKeown). Lowry meets Harry Tuttle (McKeown). Jack Lint (Gilliam) seeks to distance himself from the Buttle/Tuttle business, despite Lowry's pleadings. As a bonus, here is a jingle recorded by Michael Kamen but not used for "Sammy the Seal" (who appears on Lowry's television in the morning). The version in the finished film has no lyrics.